The current building was built in 1891 to replace an earlier building that was built in 1839. The courthouse serves as the center of county government offices, and is a dominant landmark in the downtown Dubuque area. It is located at Seventh and Central Ave in Dubuque. 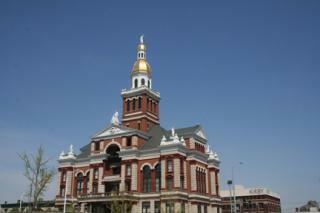 The Dubuque County Courthouse is on the National Register of Historic Places. It was one of the first buildings in the Dubuque area so honored. Over the years, a number of renovations were done to the building, including geothermal.